Product categories of Kayak Cart, we are specialized manufacturers from China, Canoe Carts, Kayak Trolley suppliers/factory, wholesale high-quality products of Coiled Paddle Leash R & D and manufacturing, we have the perfect after-sales service and technical support. Look forward to your cooperation! Packaging: Kayak Cart package is Sea delivery standard Cartons,Color box is available. The trolley is manufactured from high grade alloys with welded seams and tough, all terrain pneumatic wheels. 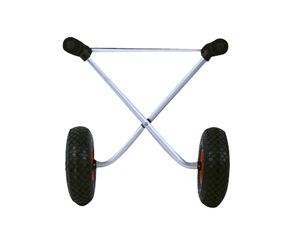 Pneumatic wheels are lightweight and strong and offer much better suspension and grip compared to normal wheels. The trolley as a whole is very compact, durable and lightweight. 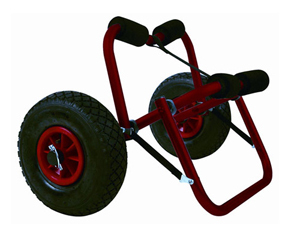 It is fitted with quick release 26cm diameter pneumatic tyres that are suitable for rough terrain including grass, sand, stone, shingle and rock. The trolley also dismantles in seconds, making it perfect to stow in your kayak if you need to take it with you whilst you are on the water. This is a must have for anyone transporting a sit on Top Kayak or, just to make the job a lot easier. Put your kayak on the trolley, load it up with all your kit for the beach and wheel it down.